Every time one of our readers clicks on one of the links to Amazon and buys something, they kick me back a couple of cents on the dollar. It is not a lot at all, but after a while it adds up and soon I have enough to buy a book or two. One of the books I got was Artisan Bread in Five Minutes a Day. This pick was mostly based upon the awesome website they setup for the book and the good reviews the book got. The book is all based around recipes that are very flexible. With almost all of the recipes you make a big batch dough, let it rise for a couple of hours and then stick it in the fridge. During the week you can just pull off a piece of dough, shape it and then bake it. 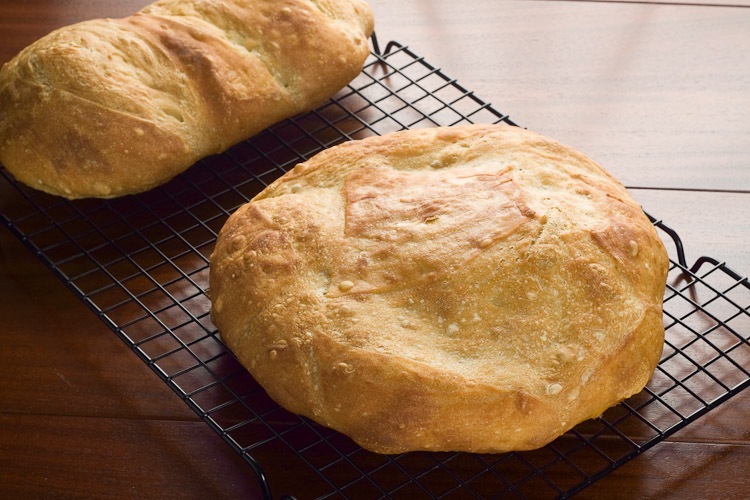 All of the recipes are focused around allowing busy people to make bread. Of course this means that you can’t pull off all types of bread, but there are a lot of varieties in the book. I definitely recommend picking up a copy, they go into a lot more detail on shaping loaves and a wide variety of recipes. I made 3 loaves and a breakfast treat involving baked eggs. All of the loaves turned out great! It was a little tricky shaping the dough because it is very wet, but as long as you throw a good amount of flour down it is not too tough. I used corn meal to prevent the loaf from sticking to the peel, but apparently I didn’t use enough. It got stuck and my road loaf turned into a rectangular one as I wrestled it into the oven. I am going to stick with parchment paper. I also skipped the part about steaming, I am lazy like that! In a large plastic resealable container, mix yeast and salt into 3 cups lukewarm (about 100 degrees) water. Using a large spoon, stir in flour, mixing until mixture is uniformly moist with no dry patches. Do not knead. Dough will be wet and loose enough to conform to shape of plastic container. Cover, but not with an airtight lid. When ready to bake, sprinkle cornmeal on a pizza peel or use parchment paper. Place a broiler pan on bottom rack of oven. Place baking stone on middle rack and preheat oven to 450 degrees, preheating baking stone for at least 20 minutes. Place shaped dough on prepared pizza peel and let rest, uncovered, for 40 minutes. Repeat with remaining dough or refrigerate it in lidded container. 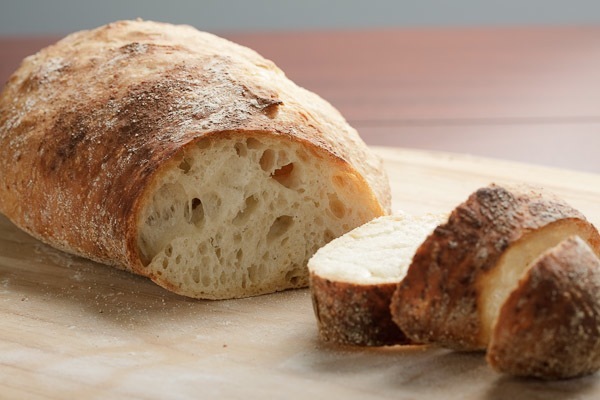 (Even one day’s storage improves flavor and texture of bread. Dough can also be frozen in 1-pound portions in airtight containers and defrosted overnight in refrigerator prior to baking day.) Dust dough with flour. Using a serrated knife, slash top of dough in three parallel, 1/4-inch deep cuts (or in a tic-tac-toe pattern). Slide dough onto preheated baking stone. Pour 1 cup hot tap water into broiler pan and quickly close oven door to trap steam. Bake until crust is well-browned and firm to the touch, about 30 minutes. Remove from oven to a wire rack and cool completely. Hi, I bake all of my own bread now using the above book, and I just want to say, DON”T SKIP THE STEAM PART!!! It’s really really easy, and it makes a HUGE difference in the crust.